The new state government continues to win the hearts of the rakyat by awarding last year's top SPM and STPM students. The people of Penang are indeed happy to see these high achievers being rewarded. Of course, I'm also very happy. I collected RM200 on Denise's behalf. There's also a certificate signed by the CM himself. We also had the honour of shaking hands with Lim Guan Eng on the stage. 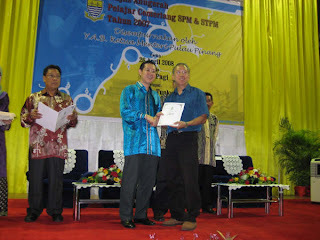 That's me receiving the award from Lim Guan Eng on behalf of Denise. At the end of the ceremony the other receipients from MGS took a photo with the MGS Principal and the CM. These awards were given to SPM students who got all 1A's and STPM students who got 4.00 for their CGPA. There were also 6 special awards given to the best 6 SPM students and best 3 STPM students. When one of the top 6 awards was awarded to one of the MGS girls, we were at first puzzled as to why she was singled out since the other 7 MGS girls did equally well, if not better . Later we realized that the awards were actually given to reflect the racial composition: 2 Chinese, 2 Malays, 2 Indians . That explains why someone with CGPA 3.92 was awarded the top 3 STPM students of Penang despite scores of others with perfect 4.00 CGPA. The top 3 awards were actually for the top Chinese, top Malay and top Indian STPM student from the state.